Successful people more often than not get to be that by dint of hard work. It’s almost unavoidable. Some become successful by luck or inheritance, but not by sweat equity. I recently met a most interesting and hard working woman named Lisa Westleigh from Sabattus, and I want to tell you about her. She’s well on the road to success, and it’s all got only a little luck involved. 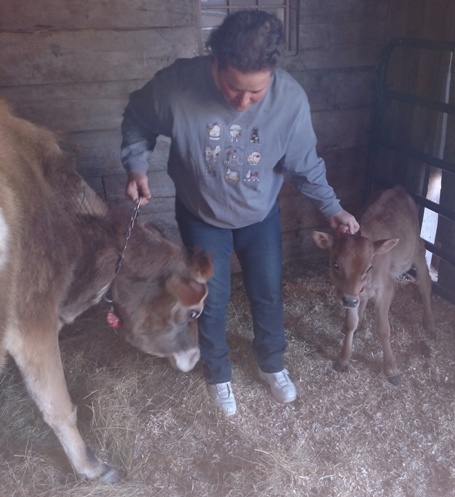 Coming out of a difficult life situation some years ago, Lisa desperately wanted to be self-sufficient and after much self-evaluation her dream was narrowed down to --–you’ll never guess---buying Jersey cows and making home-made butter from their milk. I know, weird, right? Not to Lisa Westleigh! Oh, and in case you think Jersey cows come from New Jersey, they originated on the Island of Jersey, a small British island in the English Channel off the coast of France, and it’s one of the oldest dairy breeds. I have a personal and special connection with them because when I was a kid a big advertising campaign began with Elsie the Borden Cow---she was a Jersey, arguably the most beautiful breed of cow on earth. I was tortured daily by the Boys of the Fifth Grade because of dear old Elsie---you know, the usual udder jokes with which fifth grade boys can be most creative, but I have moved on. Really. I have. That I changed my name to LC has nothing to do with all this. Eventually Elsie (the cow that is) married Elmer and in the proper amount of time, gave birth to Beulah and later to her brother Beauregard. Happy family. Ultimately got into the glue business, I think. Anyway, Lisa Westleigh needed a farm, and again luck kicked in and she became friendly with Ray and Tina Ellsworth who happened to have a huge recently unused farm in Sabattus and knew a lot about the dairy business, Lisa was starting a herd, she was dreaming of Jersey cow butter, and a friendship and business was born. Now I’m not here today to hawk Lisa Westleigh’s all natural home-made butter, but it’s unusual; intense and delicious, cookable and eatable right off the knife, and no I’d never do that. Not. I was very curious as to how butter is made and even though Lisa is a great representation of pioneer women, I did most stupidly once ask her if she churns from a big wooden thing with a wooden plunger, and of course she frowned, and looked at me as if I’d suddenly turned into Lady Lunatic. One word answer; “No.” Apparently she does not sit on her front porch churning her butter in a wooden churner thing. Apparently today it’s all electric now. Who knew? This nice pretty woman with a warm, strong handshake and big grin, had an epiphany at age 34, that this was what she wanted to do. Raise Jerseys and make butter. When I was 34, my personal epiphanies most assuredly did not include taking on a career involving exceedingly hard work, to say nothing about getting up while it’s still dark outside, but then that’s just me. Lisa was determined. Divorced and eager, she began to make plans, and these plans included Jersey cows and making home-made, natural butter. She lived in a camper back then, and today the results of her epiphanies are actually happening. The butter is there and she sells it to people. They think it’s fabulous. You’re dying to know what’s in this weirdly delicious butter, right? Jersey cow cream and sea salt. That’s it. Churned. Electrically. The milk from those long-lashed beauties never sees the air—it all goes magically from cow to butter. Please don’t write in for details. I have no clue how all this happens. It just does. Lisa’s cows eat pretty well for cows, good corn and hay I think, and it’s clear this strong woman has studied hard and learned everything there is to know about the business of butter making. And cow raising. Lisa Westleigh’s long-term goals are simple, modest and strong. And happy. She would like to live on her own farm which she’ll call the “Itty Bitty Farm” in a mobile home with her son Thomas who today helps her with her butter dreams, a wood stove, simple and uncomplicated creature comforts, and all surrounded by her gentle, beautiful butter making bovines.